Do you want to tidy up your clutter closets and create extra storage space under the bed? 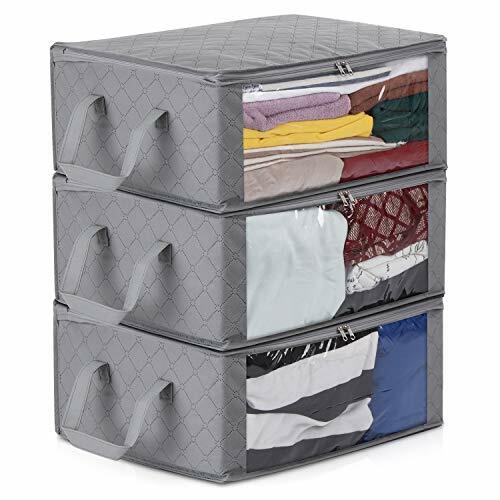 Need a bed storage container which can keep out bugs and for store your out of season clothes, linens, sheets and blankets? Try to use our Magicfly Zippered Clothes Organizer. Our storage bag can help you solve these troubles, especially suitable for storing all kinds of clothes, blankets, coats and other large objects.It also uses the window design, so that we can visually see the items inside the store. Heavy duty vinyl material, a thin layer can also save a lot of space, beautiful structure, convenient collection, has a portable ring front, easy to carry. Usage: Fits for clothes, sweaters, bath towels, quilts, summer comforters, vintage linens and crocheted items etc.Great for garment and bedding storage. Perfect at dorm, college for garment, closet, bedding or under bed storage.